We’d love your help. 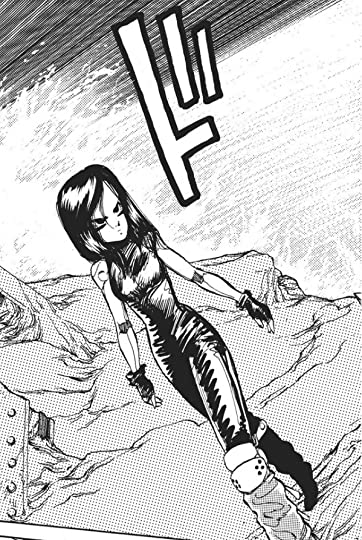 Let us know what’s wrong with this preview of Battle Angel Alita, Volume 02 by Yukito Kishiro. Alita's mastery of the lethal Panzer Kunst technique may not help her in volume 2 of this popular series. Her worst enemy may be herself. To ask other readers questions about Battle Angel Alita, Volume 02, please sign up. 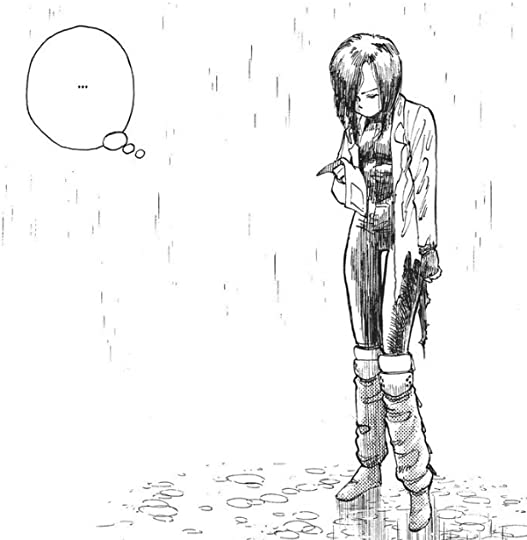 Clichès abound here, but second volume of Gunnm/Alita is just far better, deeper and sadder than previous one. And poor, dreaming Yugo and his backstory are just impossible to forget. An improvement over the first volume thanks to it being a more emotional read. Kishiro lets Alita fall in love with a human being that also happens to be a scrapper who dispossesses cyborgs of their spinal columns to earn money for his move up to Zalem (the city towering above the scrapyard). This way he's asking some tough questions of his heroine, who’s already struggling with her very existence anyway. This second volume offers a much deeper story and successfully walks the fine line between sh An improvement over the first volume thanks to it being a more emotional read. This second volume offers a much deeper story and successfully walks the fine line between showing Alita’s weaknesses as well as her growing strength. There’s again a nice upgrowth to see in the main character. We get a lot more details on the world these characters live in, which positions the series clearer as dystopian fiction than the first volume did. this volume now also gets the reader more invested in the characters as they are facing some hardships. I even had a moment of sympathy for the antagonist of the last volume, who makes a somewhat surprising appearance here. Hard to believe if you’ve only read volume 1 of the series, I know. Overall a very good second book. I enjoyed this one as much as I liked the first one. Not too sure if I like Yugo all that much what with his flexible moral outlook. 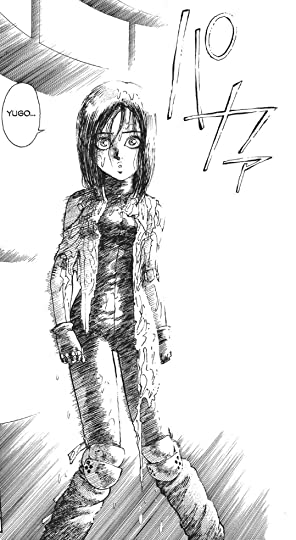 Alita is a total bada** though and I love how loyal and fierce she is. The plot was creative and I look forward to seeing what happens. Alita gets a boyfriend! But he has an unsavory side job and when he incurs a bounty, Alita has to make a difficult decision: bring in his head or help him escape and become a fugitive herself. This is the story arc I remember best, probably because it was adapted for the animated production years ago, which I have watched at least a couple times. Much better than the first volume. Mucho mejor que el primer tomo!! So, spoiler alert, but in this one, at one point, from a panel to the next, a teenager gets his arm ripped off and his girlfriend cuts off his head to keep him alive. That's a new one. While this volume has a deeper story than the first, and the art is just as amazing, it's just not quite as fun. Still damn good, mind, and a worthwhile read for any manga or cyberpunk fan. Wow let's clear this is 4.5 so there's that and now, I am flowing through these to try to finish them before going to watch the movie and so far it's wonderful at least in the Manga world. This is even better than the last one and here obviously Alita falls for a human and then wonders on her own form and desires and more. This one is sadder and more gripping than the first book but that's not such a huge stretch as now the character was established and now we are getting the character developme Wow let's clear this is 4.5 so there's that and now, I am flowing through these to try to finish them before going to watch the movie and so far it's wonderful at least in the Manga world. This is even better than the last one and here obviously Alita falls for a human and then wonders on her own form and desires and more. This one is sadder and more gripping than the first book but that's not such a huge stretch as now the character was established and now we are getting the character development. Here's also my mind is understanding that the movie can't be based on a single issue because one volume when it can be read in an hour won't translate to a movie. So the movie will span multiple volumes and pick it's story with the characters there. I liked Hugo, liked how Vector looks just like Mahershala Ali, just perfect. Now I will be moving on to the next issues and why not after all my mission is to Keep on Reading and also gotta finish the series before watching the movie preferably in IMAX. 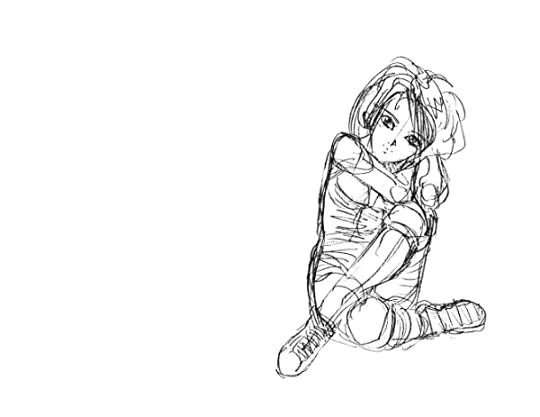 Working as a hunter-warrior (Bounty-hunter) Alita meets a young b Another of my favourite manga series that initially got me interested in Japanese manga and anime, Battle Angel Alita is another classic Japanese manga from the early 1990s. Working as a hunter-warrior (Bounty-hunter) Alita meets a young boy who dreams of leaving the Scrapyard for Tiphares. Alita finds herself falling in love with the boy, although she deosn't know what his feelings towards her are. Warning! Warning! Really dumb romance ahead! In this volume, Alita falls in love with a street kid named Yugo. She doesn't seem to have any particular reason for falling in love with him except a shallow crush, but then she (SPOILERS PEOPLE) just decides to throw away her life to follow him even before the brat has said anything about his feelings for her... and the fact that he is literally stealing people's spines for the underground market. Basically, Alita is an idiot. I still like the art, t Warning! Warning! Really dumb romance ahead! In this volume, Alita falls in love with a street kid named Yugo. She doesn't seem to have any particular reason for falling in love with him except a shallow crush, but then she (SPOILERS PEOPLE) just decides to throw away her life to follow him even before the brat has said anything about his feelings for her... and the fact that he is literally stealing people's spines for the underground market. Que buena historia. Pero sobre todo, que interesante planteamiento, en el cual expone la cosificación del ser humano, al grado tal, de correr el riesgo de desvalorar la propia vida por priorizar lo material y junto con ello la perdida de la dignidad, así como de valores tan necsarios como la solidaridad, el respeto, la compasión y el amor mismo. En los ojos de "Galy", nuestra querida andride, descubrimos a profudidad lo complejo y paradojico que son nuestros propios sentimientos. Pero en ella es Que buena historia. Pero sobre todo, que interesante planteamiento, en el cual expone la cosificación del ser humano, al grado tal, de correr el riesgo de desvalorar la propia vida por priorizar lo material y junto con ello la perdida de la dignidad, así como de valores tan necsarios como la solidaridad, el respeto, la compasión y el amor mismo. En los ojos de "Galy", nuestra querida andride, descubrimos a profudidad lo complejo y paradojico que son nuestros propios sentimientos. Pero en ella esta esa esperanza que es necesaria recobrar por encima de todas las cosas. Even better than the first one! I loved the introduction of the new characters and the development of the old ones. I'm really liking this series. I love Alita. She's great. In this volume Alita finds a love interest. She's figuring out who she is all while being badass. I love it. Relevant inclusion of technology in the story world and it all fits together (see some of the explanation at the end of this volume (appendixes are many times better than slowing down the plot with info dumps, many times disguised as dialogue). For example, (view spoiler)[Tiphares is the bottom floor of a space elevator. (hide spoiler)] I like the little footnotes describing the technology behind Alita's different fighting abilities and some of the situations. So cute. Alita falls in love. The plot is slowly building up and from what the trailer showed it should most likely be based on the first two for the different characters. I am curious to see how it develops, though it is starting to be a tad repetetive in action. In den Kampfszenen zu unübersichtlich. Hier am schönsten die aufflammende Liebe zu Yugo, der allerdings unbedingt nach Zalem will, was dann - anders als geplant - in die Hose geht (deswegen "Tears of an Angel"). Fokus leider etwas weg von Alita und Ido. An excellent follow-up to Alita’s story that has its cyberpunk action 🤖 , as well as introducing a love interest 💕 for her and a supposed main villain 🕶 (Grade: A). Just rereading prior to the movie. Lame romance arc. Interesting twist though. I really disliked the first volume, but in desperation for something quick and simple to read after finishing the "Wind Up Bird Chronicle" and with few options of decent manga at my local branch library I picked up volume 2. And liked it. Still not great and prone to cliche, but the story in this is both more human and more disturbing. I don't think I'll ever get used to Manga's bizzare welding of "cool" with "cute," but most of the time it worked. 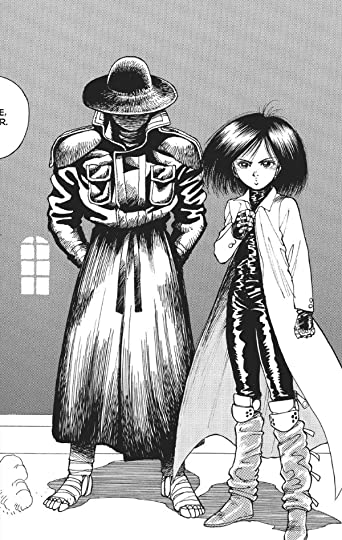 Alita meets Yugo, a teenager who is living by himself and working very hard to support himself. Alita is immediately attracted to him, his brash manner, and the way he admires Zalem, the city in the sky where the wealthy people live. When a criminal Alita is tracking attacks, Alita conceals her fighting abilities from Yugo, which I found very strange. Alita softens up the criminal behind Yugo’s back (literally) but Yugo kills him and claims the head. Alita has been disgusted with the practice of Alita meets Yugo, a teenager who is living by himself and working very hard to support himself. Alita is immediately attracted to him, his brash manner, and the way he admires Zalem, the city in the sky where the wealthy people live. When a criminal Alita is tracking attacks, Alita conceals her fighting abilities from Yugo, which I found very strange. 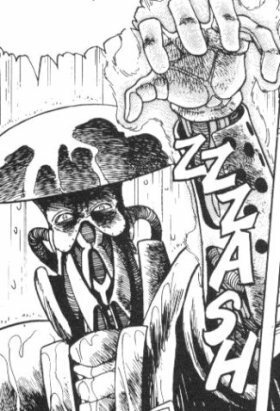 Alita softens up the criminal behind Yugo’s back (literally) but Yugo kills him and claims the head. Alita has been disgusted with the practice of bringing in heads to get paid but when Yugo tells her that he needs to gather 10 million credits so that he can go to Zalem, Alita decides to help him. Yep, Alita has fallen in love with Yugo. Unfortunately for her, he doesn’t feel the same way, focusing on his jobs instead. Definitivamente hubiera querido leer esta serie antes. Cuando este tomo me estaba pareciendo bueno a secas (la historia de amor de Gally a la mitad del volumen no me había entusiasmada de sobre manera) y pensaba que le pondría 3 o 4 estrellas, la historia da un giro impresionante, revelándote un par de pistas sobre lo que está ocurriendo en ese mundo y lo que podría significar Zalem. Además al poner a Gally en un dilema del corazón, el autor nos regala unos matices de sus personajes que contrast Definitivamente hubiera querido leer esta serie antes. Cuando este tomo me estaba pareciendo bueno a secas (la historia de amor de Gally a la mitad del volumen no me había entusiasmada de sobre manera) y pensaba que le pondría 3 o 4 estrellas, la historia da un giro impresionante, revelándote un par de pistas sobre lo que está ocurriendo en ese mundo y lo que podría significar Zalem. Además al poner a Gally en un dilema del corazón, el autor nos regala unos matices de sus personajes que contrastan muy bien entre Gally y Yuto. Los últimos capítulos de este volumen son una joya porque poseen revelaciones, decisiones difíciles, buenos combates, y un cambio en el status quo que no pensé nos darían tan pronto en la serie. GUNM es una de las mejores series japonesas de ciencia ficción que he leído y siento que no se le ha dado la popularidad que merece. Al menos este primer par de volúmenes me han emocionado más que el primer volumen de Akira o el 1.5 y el 2 de Ghost in the Shell. Battle Angel Alita deals with some pretty dark themes: loss, oppression, obsession, and it largely does so without becoming pedantic. The love story in this volume is a perfect example of that, exploring mixed signals, unrequited feelings, and how sometimes you just can't do anything to help someone, regardless of how much you care about them. It's tragic, thought-provoking, and it does as much to build the world of the Scrapyard and Tiphares, as it does to flesh out the characters who inhabit i Battle Angel Alita deals with some pretty dark themes: loss, oppression, obsession, and it largely does so without becoming pedantic. The love story in this volume is a perfect example of that, exploring mixed signals, unrequited feelings, and how sometimes you just can't do anything to help someone, regardless of how much you care about them. It's tragic, thought-provoking, and it does as much to build the world of the Scrapyard and Tiphares, as it does to flesh out the characters who inhabit it. It says a lot, that a series that includes such things as robots, werewolves, and people getting decapitated for money can address such heavy subjects without losing anything in the process. This volume has a lot to say about its world, yes, but also about life itself, and it says it well. And as an added bonus, the romance here is a lot more nuanced, complicated, and engaging than it was in the movie adaptation. Alita still falls for Hugo pretty hard, but the lead-up isn't nearly as sudden, and their relationship itself is nowhere near as trope-y. Anyone who can create a character like Alita is certainly able to develop her further, and that's what happens in this second volume of the Alita story. It answers the question, can a cyborg have emotions (that question naturally occurs to a reader of volume 1), and Mr. Kishiro says yes. Alita meets a human, Yugo, and begins to feel what is obviously love (obvious to the reader -- not to her, because she remembers nothing of the time before Ido equipped her with her new body). 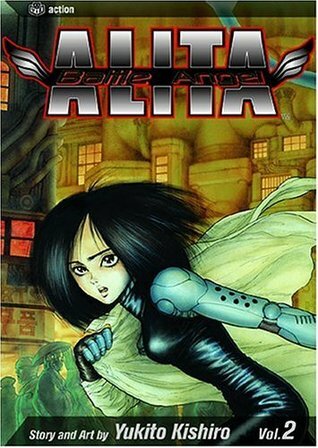 This volume contin Anyone who can create a character like Alita is certainly able to develop her further, and that's what happens in this second volume of the Alita story. It answers the question, can a cyborg have emotions (that question naturally occurs to a reader of volume 1), and Mr. Kishiro says yes. 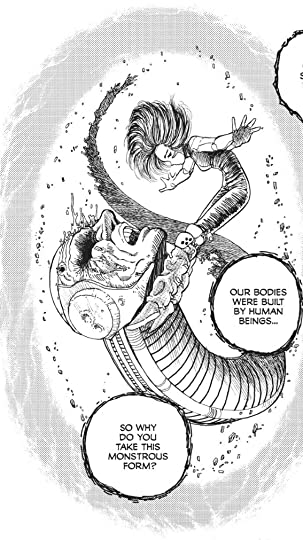 Alita meets a human, Yugo, and begins to feel what is obviously love (obvious to the reader -- not to her, because she remembers nothing of the time before Ido equipped her with her new body). This volume continues the elegant graphics and subtle, scholarly details of the first one with a deeper psychology. I liked it better than the first instalment, perhaps because it seemed to place less emphasis on the action, even though there remains plenty. Indeed, Volume 2 picks up right were we left off and nicely wraps up the story of Makaku while expanding on his tragic backstory, what will become a running theme in this series no doubt. New characters, like Yugo and Vector, are introduced, old ones like Zapan make a return, and some are only hinted at. Volume 2 explores Gally's relationship with Yugo, a I liked it better than the first instalment, perhaps because it seemed to place less emphasis on the action, even though there remains plenty. Indeed, Volume 2 picks up right were we left off and nicely wraps up the story of Makaku while expanding on his tragic backstory, what will become a running theme in this series no doubt. New characters, like Yugo and Vector, are introduced, old ones like Zapan make a return, and some are only hinted at. Volume 2 explores Gally's relationship with Yugo, and in this respect the live-action adaptation is quite faithful... to a point. Do not expect to read about motorball in this volume, nor is there any sort of redemption arc for the character of Yugo to be found. Should there even be one? Yugo's is yet another tragic story about the lengths people will go to to survive in The Scrapyard, and the heavy price of dreaming in this bleak world. The book starts out with finishing off the end of the first book. Then she meets the boy Yogo. They meet Zapan and then he gets blamed for a murder. They run from Zapan and the other hunters she and Yogo. Hideout for a little in Yogos brothers old home and then the hunters find him and alita fake kills Yogo but saves him by connecting her heart to his head and saving his life and while all that is going on Zapan gets his face cut off. The primary romance in the book is based around Alita and Yogo The book starts out with finishing off the end of the first book. Then she meets the boy Yogo. They meet Zapan and then he gets blamed for a murder. They run from Zapan and the other hunters she and Yogo. Hideout for a little in Yogos brothers old home and then the hunters find him and alita fake kills Yogo but saves him by connecting her heart to his head and saving his life and while all that is going on Zapan gets his face cut off. The primary romance in the book is based around Alita and Yogo. Yogo meets Alita or rather the other way around she runs into him when they are both looking at the city. And then Yoga gets in trouble and she has to kill him to save his life. In my opinion, I think the book was very interesting. It has a deep backstory and it is very interactive to read. It’s also a shorter book so it didn't take too long to read. Esta es una de las historias que más recordaba. 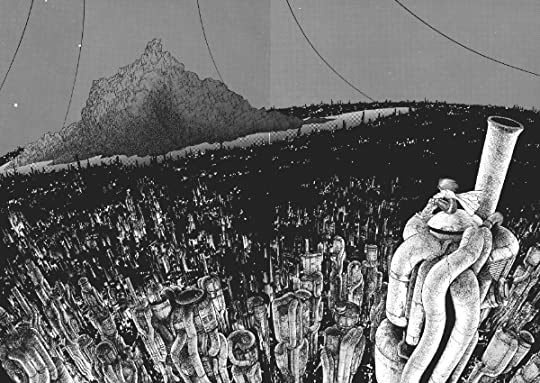 Me encanta el mundo post-apocalíptico de Gunnm, tan crudo y cruel, y como Yukito Kishiro intenta meter una historia de amor en ese ambiente tan violento. Yugo es un personaje ambiguo, un criminal con corazón de oro, con una moral un poco torcida, pero con un lado amable y soñador que es justamente del que se enamora Gally. Lo que más me gusta es como el autor utiliza este arco de romance para desarrollar como funciona el mundillo criminal y expandi Esta es una de las historias que más recordaba. Me encanta el mundo post-apocalíptico de Gunnm, tan crudo y cruel, y como Yukito Kishiro intenta meter una historia de amor en ese ambiente tan violento. Yugo es un personaje ambiguo, un criminal con corazón de oro, con una moral un poco torcida, pero con un lado amable y soñador que es justamente del que se enamora Gally.